Social Sciences Dean Katharyne Mitchell, left, hosted the division's annual fall breakfast. She is pictured with Psychology Professor Barbara Rogoff, who received the Martin M. Chemers Award for Outstanding Research, and Psychology Chair Cam Leaper. 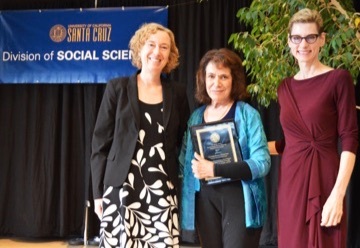 The Division of Social Sciences at UC Santa Cruz presented four major awards today (Wednesday, October 11), recognizing outstanding accomplishments by faculty, staff, researchers, and emeriti faculty. "It's a pleasure to recognize the extraordinary contributions and accomplishments of our faculty and staff across the Division of Social Sciences," said Mitchell. "Collectively, these four people have provided nearly 100 years of service to UC Santa Cruz. We are fortunate to call them colleagues." Golden Apple Teaching Award: Associate Professor of Sociology Deborah Gould is this year's recipient. Gould, who joined the faculty in 2009, was recognized for her teaching and mentorship. She is "deeply respected by her colleagues and students for her relentless commitment to teaching high-quality sociology graduate and undergraduate courses across the curriculum." Gould creates an open and inclusive classroom environment, and students value her as a passionate, inspiring, extremely knowledgeable, helpful, and approachable faculty member. Gould received a $2,500 cash award and a golden apple trophy. 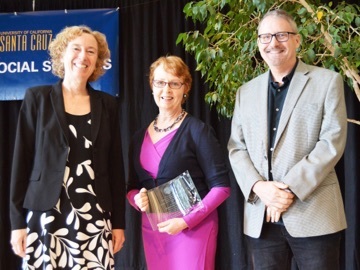 Martin M. Chemers Award for Outstanding Research: Barbara Rogoff, the UC Santa Cruz Foundation Distinguished Professor of Psychology, has made vast contributions to the field of developmental psychology. Her research analyzes changing cultural practices of learning by children by integrating the individual, interpersonal, and cultural aspects of early development in different cultural contexts, especially Guatemala. She has published an extraordinary number of books and journal articles and is deeply committed to mentoring her colleagues and students. Rogoff, who joined the faculty in 1991, received a $2,500 cash prize and a crystal trophy. Outstanding Staff Award: Martha Brown, senior editor for the Center for Agroecology and Sustainable Food Systems, was recognized for her contributions to numerous publications, as well as for her "wisdom, experience, historical perspective, and common sense problem solving skills." Brown was nominated by an "impressive range" of colleagues who appreciate the quality and impact of her work, as well as her dedication, good humor, availability, and willingness to collaborate. Brown, who joined the staff in 1984, received a $1,500 cash prize and a plaque. Distinguished Social Sciences Emeriti Award: Professor Emerita Catherine Cooper of Psychology was recognized as a "visionary scholar" whose scholarship has empowered youth to help themselves. Founder of the developmental psychology doctoral program at UC Santa Cruz, Cooper is widely known for her research on the academic development of underrepresented and under-resourced youth. Her work focuses on how students forge their personal identities, exploring how they navigate their cultural and family traditions with those of their schools, communities, and workplaces. Her research has impacted colleagues, students, teachers, community organizations, lawmakers, and adolescents and their families. Cooper joined the faculty in 1987 and retired in 2012, but she remains active in research, and she also serves on numerous campus, community, and UC boards and organizations. The award includes a plaque.